Winsford neuromuscular charity supported by housebuilder’s scheme – Our Space, Your Place. Local charity, Winsford NeuroMuscular Centre is celebrating after receiving a donation from David Wilson Homes North West’s Our Space, Your Place scheme. 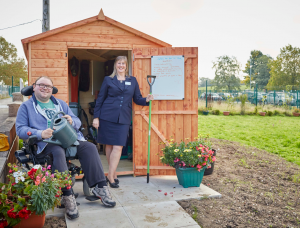 The housebuilder’s scheme, which offers support to community groups in the region through volunteer time or funding, provided a garden shed to be used by the centre’s gardening club. The gardening club acts as a respite for many of the carers and individuals who spend time at the centre, giving them a focus away from their caring role and the opportunity to meet other carers and get out into the fresh air. Winsford NeuroMuscular Centre has a team of specialist neuromuscular physiotherapists that provide assessment, treatment and advice for people with muscular dystrophy. This service can provide ongoing care determined by clinical need. It is free to all users but they do seek funding from Clinical Commissioning Groups or Healthboards. Lyndsey Cannon- Potts, head of funding at the centre, adds: “For carers who often receive no other break during the average week the ability to get outside in the fresh air and potter around NMC’s garden area has huge benefits. David Wilson Homes North West’s Our Space, Your Place scheme helps community groups with donations of volunteer time and funding. The latest round of applications is now open, and local organisations and projects in need of support can apply by visiting www.ourspaceyourplace.co.uk. For further information on David Wilson Homes North West visit www.dwh.co.uk.